Telecommunications Research Establishment (TRE) became interested in digital computing during WWII when Group 28, headed by C E Wynn-Williams, designed equipment for Bletchley Park. The code-breakers at Bletchley Park wanted to automate the breaking of the German ‘Lorenz’ cipher. Max Newman, head of a section at Bletchley dubbed “The Newmanry”, approached TRE at Malvern to design an electronic machine to implement Bill Tutte’s Double-Delta method of finding wheel start positions. The resulting machine was a joint effort between TRE and the Post Office at Dollis Hill and was known as [Heath] Robinson. Later, the Ministry of Supply decided to fund the design and production of a large electronic digital computer. This decision was probably prompted by the success of ENIAC in the USA and the experience with Colossus at Bletchley Park. Colossus had shown that circuits involving very large numbers of thermionic valves were both practical and reliable. Neither ENIAC nor Colossus, however, had an internal memory, which seriously slowed the machines down. A rapid-access internal memory was therefore seen as a key feature of any new design. 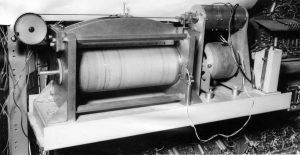 It was thought that the new computer would be largely a mathematical tool used by government scientists, probably (like ENIAC) in connection with ballistics, aircraft design, weather forecasting, and perhaps the atomic bomb. It was thought that one single large flexible and reliable computer would fulfil the computing needs of the whole country’s scientific community for the foreseeable future! The National Physical Laboratory (NPL) at Teddington was the rather surprising choice for the new computer project and work sensibly started on the internal store or memory. The favoured memory scheme was to launch the data as sonic pulses down a tube full of mercury. The data was received at the other end and converted back to an electrical signal, re-transmitted down the tube and so on. This process could be continued for long enough to regard the data as being “stored”. The technique had been used with some success during the war in radar applications. Other forms of store were considered, such as magnetic drum (the predecessor of the modern hard disk), magnetic tape, and magnetic cores – and a new scheme just invented at TRE. This new method stored the data in a pattern of electrical charges on a conventional cathode-ray tube, much like an old fashioned TV tube. The data was read with a pick-off plate in the tube and rewritten in a circular process, like the mercury tubes, until needed. By 1945, F C Williams and A M Uttley at TRE had the basic system running and began to increase the storage time and the storage density of the charges. Access time was fast and the system, using largely conventional components, was cheap. It became known as The Williams Storage Tube and it was agreed that TRE should pursue the development for the benefit of NPL. Several meetings were held between R A Smith, A M Uttley and F C Williams from TRE and Darwin, Turing and others from NPL. Speculation has thus arisen as to whether Turing ever visited Malvern, although we have found no evidence to support the story. Probably the meetings were held at Teddington or the Ministry of Supply in London. A building at Malvern was later named “Alan Turing” in his honour as a computing pioneer. 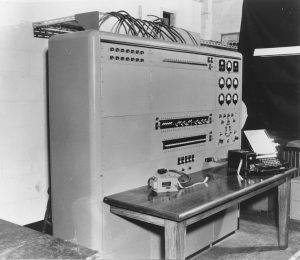 Manchester University had been interested in computers from the early 1930’s, chiefly due to the work of D R Hartree. They recruited Newman from Bletchley and, in 1947, Williams (who took Tom Kilburn and Geoff Tootill with him) from TRE. In 1949, they were joined by Turing to form the Manchester team. 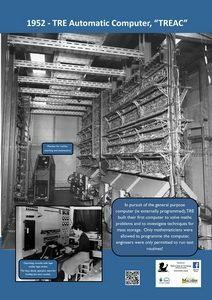 Their computer made rapid progress funded partly by the Government, via the Royal Society, and partly by Ferranti Ltd., the Manchester engineers. This collaborative work and the organisational links later led into what became International Computers Limited (ICL). In parallel, work began at TRE in 1947 to explore circuits for binary arithmetic, with further development of the Williams Storage Tube to allow parallel operation the following year and more general research to determine what facilities were ideally required of a fully automatic, high-speed digital computing machine. In around 1950, a team headed by A M Uttley and R H A Carter built TREAC in spur 12 of F block. The ‘heart’ of TREAC (in the lower right) occupied a space about 14.5m x 5.5m! 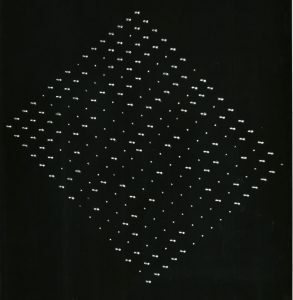 Development of the hardware continued with the addition of a magnetic drum, a spark tape punch (intended to improve output speed, but not successful), a wired program store (this held common sub-routines in magnetic rings called ‘cores’ for fast access), and a graph plotter. On the programming side, various compilers were implemented allowing the scientific staff to write their own programs. High level languages were explored by the mathematics department headed by Philip Woodward. An algebraic input code was available in 1959 and a LISP interpreter in 1961. The hardware was, however, becoming unreliable and TREAC was switched off in 1962. Sadly there is no intention to rebuild TREAC despite the many advances it made including producing the first computer synthesised music (a piece by Bach apparently). It was subsequently replaced by RREAC (RRE Automatic Computer).